Staying in is the new going out. As autumn descends and winter approaches, it may feel as though hibernation season is upon us. But fear not because entertaining at home is a great way to socialise without compromising on comfort. There’s something about home-cooked food which makes the heart and taste buds alike, sing. Sharing your delicacies with friends and family is the perfect way to try new methods and recipes or indulge with your classic dishes. But what does your dinner party say about you? Do you prefer trendy table-top dinners over elegant fine dining? Or are you an understated, ‘less-is-more’ host who opts for a simple yet delicious menu? Whatever your preference, Robert Dyas has got a wealth of products to help you prepare a feast for your guests, both online and instore. To help you find your perfect accompaniments, we’ve compiled a list of domestic gadgets and an array of dining accessories to make sure you are the host with the most, every time. Gone are the times where dinner parties meant starched napkins, cut-glass and cheese boards. Nowadays, a modern approach is favoured – especially by younger chefs – and the swankier the gadget, the better, for trend-setting hosts. Table-top food is the interactive way to prepare supper for your guests and offers a laid-back approach to hosting a gathering. This Giles & Posner 8 Piece Stone Raclette Set (Was £49.99 now £29.99) provides a simple yet fun way to cook for up to eight people. Meat, seafood and vegetables are easily prepared, and it allows diners to help with the feast by cooking their own portions, just how they like. Who says you have to dine alfresco to enjoy the colourful flavours of the Mediterranean? With the Artesa Mini Tabletop Pizza Oven (£34.99) you can bring the outdoors inside. A perfect centrepiece, guests can choose their own toppings and get creative with their food. With the ability to cook two pizzas in 15 minutes, you’ll have less time spent in the kitchen and more time with your guests. It’s not always about the food. Ensure your liquid offerings are kept at the perfect temperature with this Hostess HW02MA Tabletop 2-Bottle Wine Chiller (£73.99). Chill or warm your wine or champagne for up to two hours and with its removable power cord, your bottles will be close at hand at all times. Don’t forget the after-dinner delights! Present your puddings ski slope style with the Global Gourmet Swiss Electric Fondue Set (£29.99). Whether your guests favour a savoury or sweet treat, indulge them with melted cheese or chocolate fondue and dip away with the vessel of their choice, whether that be cold-meats, fruit or marshmallows. The perfect party piece to round off a culinary gathering. For sweet teeth, why not use these delicious Finest Belgian Milk Chocolate Chips 900g (£12.99) to create a sumptuous and indulgent chocolate extravaganza? If you prefer it cheesy, the Artesa Masterclass Cheese Platter Knife Set (£17.99 reduced to £11.99) provides a stylish way to serve your guests and a perfect present for the foodie in your life. For hosts who like nothing better than a get-together with family, there’s something about a traditional approach which makes it even cosier. Tower 3-Pot Slow Cooker and Buffet Server - Stainless Steel (£59.99 reduced to £39.99) not only conjures up a warm and hearty meal but also allows the chef to prepare way ahead of time, meaning less time spent slaving over a hot stove and more time with loved ones. Featuring three individual 1.5L trays and a buffet-style serving station, each pot has individual temperature control and allows cooked food to stay warm for up to three hours. Ideal for you and your family to enjoy and cook up a storm. What could be tastier? Who doesn’t love a Sunday roast? For the traditionalists, treat your diners to a warming and hearty lunch or supper roasted to perfection in this Russell Hobbs Vitreous Enamel Self-Basting Roaster with Lid and Rack – Black (£22.99). An essential bit of kit for any family gathering, simply place the meat on the rack along with the potatoes and vegetables for hassle-free, uncomplicated cooking. With a black vitreous-enamel coating, this smart roaster is not only incredibly durable but also easy to clean. For the fun-loving hosts, keep things quirky with some eating entertainment. 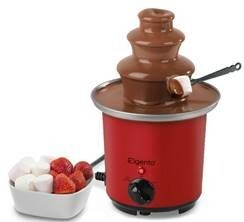 The Elgento Mini Chocolate Fountain – Red (£29.99) has three tiers and six forks, so you and your friends can get messy and indulge in the cascading chocolate. All that’s left to decide now, is what to dip in! Who says it’s only for the little ones? For the big kids amongst you, this Original Slush Puppie Machine for Home Ice Slushy Making (£59.99 reduced to £49.99) will keep your diners enthralled and chilled for hours on end. And for those who fancy re-living cinema moments, why not try the Giles and Posner Popcorn Maker (£14.99)? It takes a swift three minutes to prepare, so is perfect for making a quick snack or a bowl of popcorn to share with friends in front of a movie! For the host who prefers to hold their dinner parties with a touch of elegance, having the right equipment is key to ensuring your evening is impeccable. The Hostess 4-Plate Cordless Hot Tray (£63.99) allows chef to keep his or her creations warm until ready to serve, ideal for evening soirees. On the other hand, when you need to keep your drinks chilled, look no further than this Hostess 19 Bottle Wine Cabinet (£345.99). With an adjustable temperature setting and LED digital temperature display, you’re ensured a perfect drop with every glass you fill. 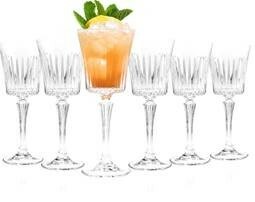 Why not go one step further and add a touch of glass to your occasion. Use this RCR 850ml Crystal Glass Oasis Square Wine Decanter – Clear (£21.99) to serve your chosen tipple. Paired with the RCR Crystal Timeless Wine Glasses - Set of 6 (£17.99) your guests can enjoy an elegant and timeless drink with every sip they take. Both items are dishwasher safe too, meaning easy cleaning after use. For the final touch, try adding this Charger Plate – Silver (£2.99) to your laid table. 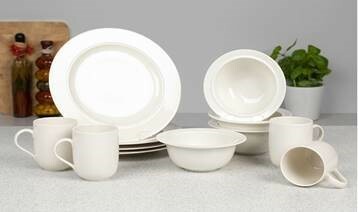 Create the wow factor by using as a decorative base for chinaware to sit on and make a lasting impression. Who says bigger is better? For hosts who like a no-frills approach to their cooking, simplicity is key, but doesn’t mean quality should be compromised. This Salter EK2401 Go Healthy Electric Soup Maker with Detachable Blades - 1000W (£38.99) makes perfect homemade soups and with a 1.5L capacity, you’ll have plenty to share around. There’s nothing quite as comforting as the smell of freshly baked bread. Welcome your guests into your home haven with the Tower Gluten-Free Digital Bread Maker (£94.99). With seventeen different settings and variable sizing capacities, you’ll provide the perfect accompaniment to any meal and any size of party. This press release was distributed by ResponseSource Press Release Wire on behalf of Robert Dyas in the following categories: Children & Teenagers, Men's Interest, Entertainment & Arts, Health, Leisure & Hobbies, Home & Garden, Women's Interest & Beauty, Consumer Technology, Food & Drink, Media & Marketing, Retail & Fashion, for more information visit https://pressreleasewire.responsesource.com/about.